MOUNTAIN VIEW, Calif.--Dec. 13, 2016-- Today eHealth, Inc. (NASDAQ:EHTH), which operates eHealth.com, the nation’s first and largest private online health insurance exchange, released the results of an online survey of small business owners who purchased group health insurance for their employees through eHealth. The average small employer who purchases coverage through eHealth has fewer than six people enrolled in their company’s health insurance plan. The survey explored employers’ feelings about the time they dedicate to managing employee benefits, about offering group coverage, and about the future of the Affordable Care Act (ACA or “Obamacare”) in the incoming Trump administration. Most small employers say the ACA has had no impact on their decisions to hire new employees (77%). 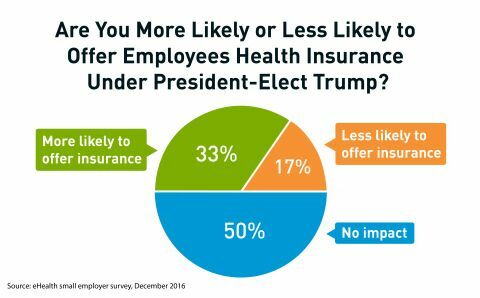 Many acknowledged that the ACA had influenced their decision to offer health insurance benefits to employees (47%) in the past and a slim majority (53%) said they expect president-elect Trump will have no impact on that decision. Similarly, two-thirds (67%) said they expect president-elect Trump to have a positive influence (39%) or no influence (28%) on the insurance they offer employees. Only one-in-five (19%) said they expected the Trump administration’s influence on their employee benefits to be bad. Of the nearly half (47%) of employers who said their decision to offer coverage was influenced by the ACA, four-in-ten (42%) said that as a result of the ACA they had delayed an employee’s eligibility for coverage; one-in-ten (9%) said they had delayed eligibility for employees’ families. One-in-five (22%) said the ACA has had no impact on the way they manage benefits, and slightly fewer (18%) said the ACA had driven them to offer more competitive health insurance for employees. Has the Affordable Care Act (“Obamacare”) influenced your decisions to hire or not hire new workers? Has the Affordable Care Act (“Obamacare”) influenced your decision to offer employees health insurance? If yes, how has the Affordable Care Act influenced the way you manage employee health benefits? eHealth’s survey found that the majority of small business owners (87%) personally manage the health insurance benefits of their employees. On average, a small employer spends about one-and-a-half (1.6) hours managing employee benefits each week. However, during their annual open enrollment period, employers say they’re spending at least one full day of work (8 hours) managing and updating employee benefits. Employers that were able to manage employee benefits with little or no paperwork saved nearly an hour per week (1 hour vs. 1.9 hours) and two hours during open enrollment when compared to those employers who reported moderate-to-heavy paperwork when managing employee benefits (7 hours vs. 9 hours). About how much time do you spend managing employee benefits each week? How much paperwork is involved in managing your employee benefits? How does paperwork affect the amount of time spent managing employee benefits? All survey participants were currently offering group health insurance coverage to employees. Most did so out of a sense of moral obligation (39%) or to retain their talented employees (29%). In spite of this, more than four-in-ten (43%) have entertained the idea of dropping health benefits for employees in the past. One-in-ten have gone so far as to actually stop offering group health coverage for a period of time. Among those employers who had thought of dropping coverage in the past, the number one reason they continued to offer employee benefits was because they felt their employees could not afford to purchase health insurance on their own. Why do you provide health insurance coverage for employees? Do you offer employees additional benefits like dental, vision or life insurance? Have you ever considered no longer offering health insurance for employees? Have you ever stopped offering health coverage to employees in the past? The findings above were compiled from a voluntary survey of small business owners who are currently offering group health insurance coverage to their workers and had purchased such coverage through eHealth. In general, the small businesses in question had fewer than ten employees. The survey was conducted by eHealth throughout the month of August 2016 with a follow-up survey conducted in November after the election. A total of 116 responses were collected. * Percentages may not add to 100% due to rounding, or because respondents selected answers that are not included in the summary provided here. eHealth, Inc. (NASDAQ:EHTH) owns eHealth.com, the nation's first and largest private health insurance exchange where individuals, families and small businesses can compare health insurance products from leading insurers side by side and purchase and enroll in coverage online. eHealth offers thousands of individual, family and small business health plans underwritten by many of the nation's leading health insurance companies. eHealth (through its subsidiaries) is licensed to sell health insurance in all 50 states and the District of Columbia. eHealth also offers educational resources and powerful online and pharmacy-based tools to help Medicare beneficiaries navigate Medicare health insurance options, choose the right plan and enroll in select plans online through Medicare.com (www.Medicare.com), eHealthMedicare.com (www.eHealthMedicare.com) and PlanPrescriber.com (www.PlanPrescriber.com).